Although Real Madrid managed to break their record-setting goal drought at the weekend, they also managed to lose 2-1 to Levante. That sees Julen Lopetegui’s job even more on the line and therefore it’s the time to talk about replacements. In the summer transfer window it was Mauricio Pochettino who appeared to be first choice and whilst the Tottenham manager flirted with the idea of managing Real Madrid one day, getting him from Spurs was just too hard for Florentino Perez. 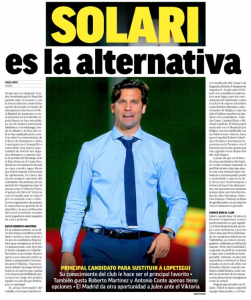 The man whose name is most prominent right now is Santiago Solari. He’s currently the manager of Real Madrid’s Castilla team and would be seen as an appointment close to the mould of Zinedine Zidane. Not only that, he can easily take over whenever Madrid are ready. There would be no dealing with another club. Marca report on Monday that Solari, Antonio Conte, Laurent Blanc, Roberto Martinez and Michael Laudrup are all options. They also explain Solari could be given a contract until the summer, and then, unless he does very well, Madrid could go for Pochettino. The Spanish newspaper believe Pochettino has ‘made it clear’ he’ll be able to ‘disassociate’ himself for Tottenham in the summer, although they don’t explain exactly what they mean by that.